This project has been developed in line with the City Centre Strategy 2014-19 which sets the vision for an inclusive city centre, where we can increase the access and attributes for all. It is hoped by making small changes we can make a huge difference to residents/visitors experience of the city. The City Centre Regeneration team are working in partnership with Autism Network Scotland and the Autism Resource Centre. Venues and organisations across Glasgow are coming together to make our city more autism friendly by introducing quiet hours and spaces, training staff and helping you prepare for your visit. The city centre is a very busy place, it’ll probably be busiest and noisiest around the Style Mile area. You can use the interactive map to help plan your visit to the city centre. 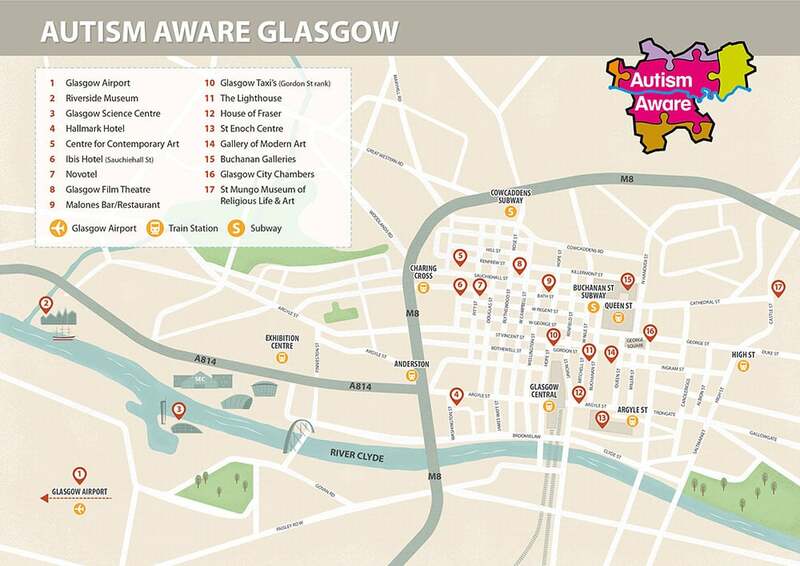 Hover over the venues to read what each organisation is doing to be more autism aware.